In a solemn, emotional ceremony, Pope Tawadros II was enthroned as the 118th Coptic Orthodox patriarch on Sunday, November 18. Only one day earlier, a different atmosphere prevailed. Acting Patriarch Bishop Pachomious announced the withdrawal of church representation from the constituent assembly writing Egypt’s new constitution. As Pope Tawadros took his seat on the papal chair of St. Mark, he was the picture of spiritual reflection. His demeanor was subdued, almost resigned to his new responsibilities. On a few occasions he shed a tear. Two days prior, the church – behind closed doors – was the picture of enflamed political discussion. The contrast, of course, is with the Egyptian political system, which the church strove hard to rise above. But why would Pachomious make such a critical decision a day before the new pope, presumably, should start guiding these matters? According to Bishop Yohanna Golta, Deputy Patriarch of the Coptic Catholic Church and its representative in the constituent assembly, the pope’s distance was deliberate. “The goal of Bishop Pachomious’s announcement … was to avoid entangling the new pope in this matter,” he said. Politics entered the papal ceremony through another route – the decision of President Morsy not to attend. Many saw this as a failure to assuage the Copts amid an Islamist presidency, but others were relieved. Perhaps Morsi, like Pachomious, also spared Tawadros the difficulty of political complications. The pope may prefer a non-politicized papacy, but this luxury may not be afforded until Egypt’s government stabilizes, if then. Regardless of the explanation, during the ceremony Bishop Pachomious publically thanked President Morsy for sending a deputy, but focused on the spiritual definition of leadership. ‘We are the children of St. Mark,’ he said, ‘who taught us to wash each other’s feet.’ In this he referred to the example of Jesus, who took the place of a servant to wash the feet of his disciples. 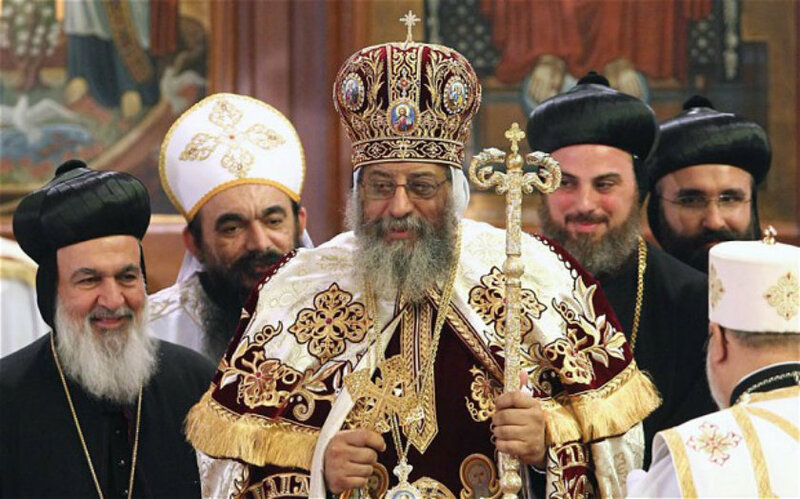 Perhaps Pachomious and the church did so for Pope Tawadros, leaving him enough room to change the decision positively should circumstances warrant. Though only speculation, perhaps it was these wranglings which produced Tawadros’ tears. Please click here to read the whole article on EgyptSource.